I will NOT take the responsibility if your project got completly messed up. So make sure you use backup. If you changed text, in your map - you have to "relocalize" your map as GE does not change the values of all available locales, so simply use the programm another time :), to write from your primary-locale to the others again. dumb it down a bit? provide some options that might help make it work for me, or facts of why it is not working?? So I've made it passed that extraction part, saw the image and assumed im supposed to put in my primary language in the options and just close it? nothing says that the language i chose stuck, feels wrong just closing it. I clicked localize anyway and now it says done... I opened the map and I still have the funky letters and numbers param/value/ mess.. Please clarify that I did everything right. Edit: my map was fixed. I ddnt know it had been because the letters kept showing up in game, all i had to do was name the triggers. THX! Hm, if I understood it correctly this tool will take the primary localization file and overwrites the other languages with its content, right? Could you change it so it would first read all the files to get all the entries. Then it would write all entries to all languages and just for duplicate keys it would fall back to the selected primary language. romexiom - can you give me the languages used on SEA ? @ciopo: gonna look into it, the "localize to" you are referring is the option Primary Localization ? I'm on enGB sc2 and editor, i've opened an enUS map for editing here and there, saved some changes. It's either the part that i modified or everything else, based on to what i try to localize. If i try to localize to enGB, the triggers I wrote in enGB already go "blank", if i try to localize to enUS, all things that are already on enUS go "blank"
This tool is amazing. I've put it to good use. Thank you so much! Edit: upon further testing enUS clients can read my enGB library, but don't know about non english clients. Beta is still not up in Europe and I can't get an answer on IRC about this, so i'll ask here. 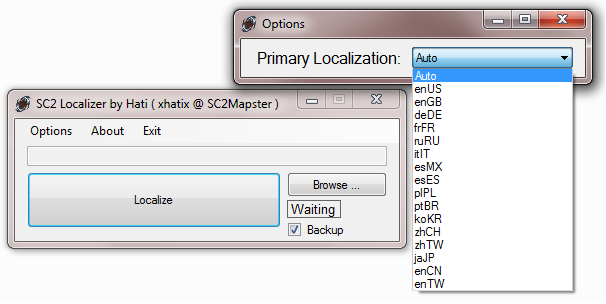 Do we still need to use this program to localize our maps, or does the new editor have a way to handle it now?